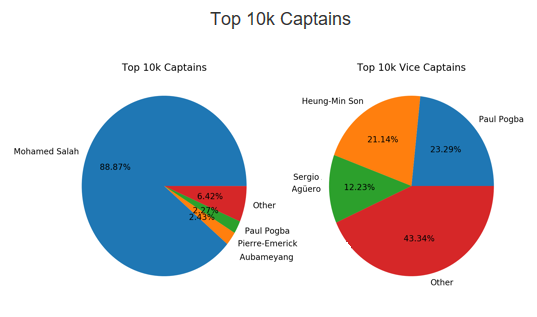 The top 10,000 managers in Fantasy Premier League have joined the rest of us in moving en masse for Son Heung-min (£8.8m). The Spurs midfielder was snapped up by just over 550,000 FPL managers in the run-up to Gameweek 26 – that’s almost twice as many transfers in as the next-most-bought player of this weekend. 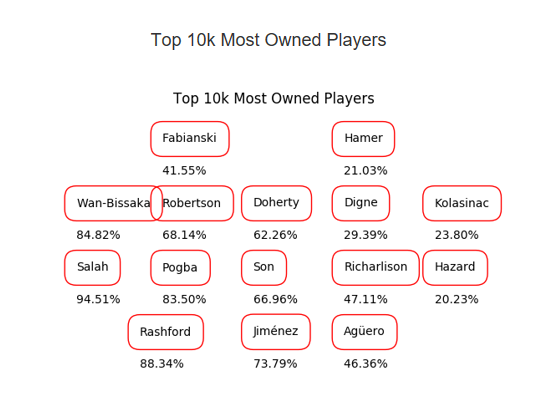 A look at the most-owned players among the top 10k (see below) reveals that Son is the only change to the “template” squad from the previous Gameweek, with Leroy Sane (£9.6m) unsurprisingly making way. Mohamed Salah (£13.6m) remains the most-owned player in the top 10,000, followed by Marcus Rashford (£7.8m) – who was benched at Craven Cottage earlier today – and Aaron Wan-Bissaka (£4.6m). The above template squad features four players who blank in Gameweek 27 – namely Lucas Digne (£5.3m), Richarlison (£6.7m), Eden Hazard (£10.9m) and Sergio Aguero (£11.4m). Marcos Alonso (£6.5m), Ederson (£5.6m), Virgil van Dijk (£6.5m) and Alisson (£6.0m) are the four names that differ; Alonso and Ederson being two more players without a fixture in Gameweek 27. Son for Sane and Raul Jimenez (£6.7m) for Pierre-Emerick Aubameyang (£11.2m) are the two changes from Gameweek 25. 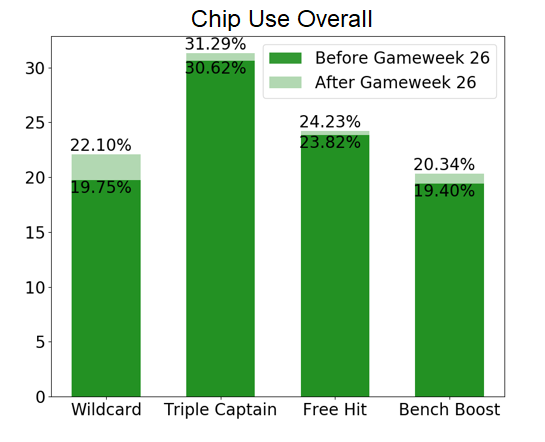 There unsurprisingly hasn’t been a great deal of chip activity this weekend, though we may see a very minor spike in the usage of the free hit chip in Gameweek 27 among those Fantasy managers whose squads are overloaded with Manchester City, Everton and Chelsea assets. 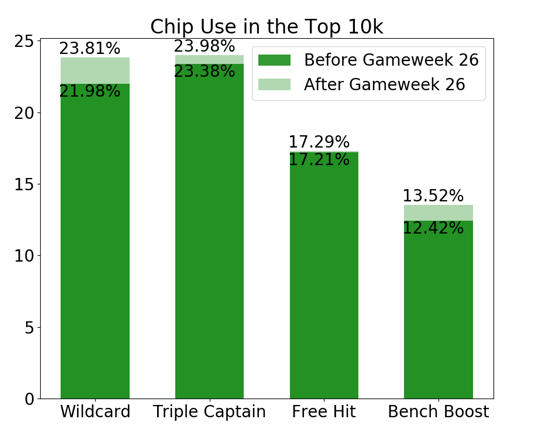 Just over 17% of managers inside the top 10,000 have used their free hit chip already. 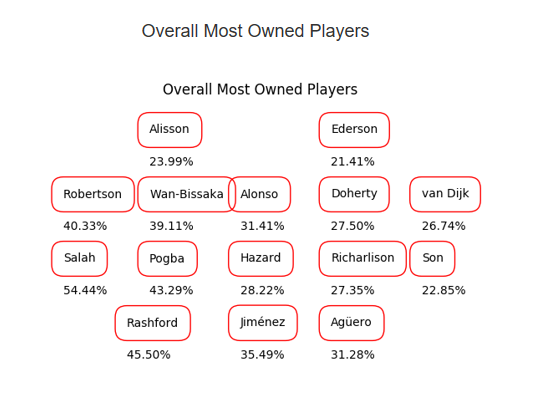 Over 75% of managers in the top 10k have their triple captain chip still to play, while a similar number also have their second wildcard still to burn. Bench boost remains the least-used chip among these high-performing Fantasy managers. 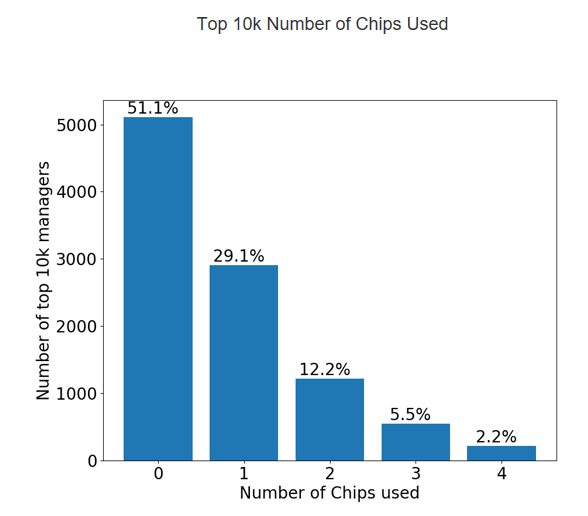 Almost exactly one in five managers inside the top 10k in FPL have used two or more of their chips already this season (see below). 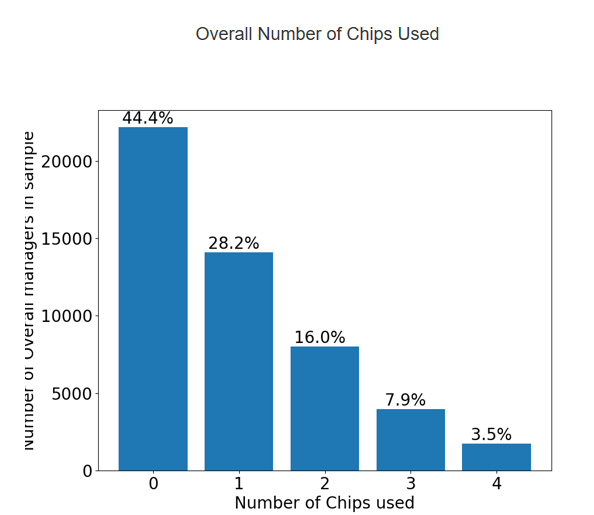 Just over 50% of the top 10,000 Fantasy bosses are still yet to use a single chip, however. Switching our attention back to Gameweek 26, the top 10k largely backed Salah for the armband ahead of his eight-point return against Bournemouth. The 2.27% who captained Paul Pogba (£8.7m) will be sitting pretty on 32 points once bonus is added, while a similar number captained Aubameyang and will be relying on their vice-captain for points (Pogba being a popular choice) after the Gabonese forward’s no-show at Huddersfield. 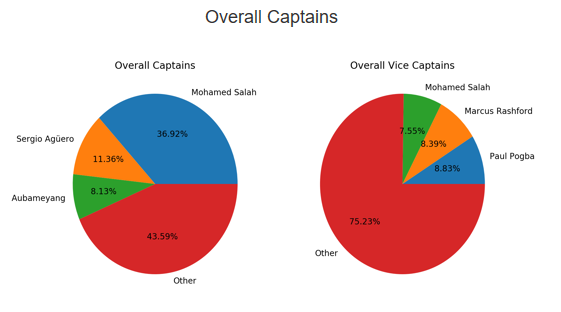 The overall Gameweek 26 captaincy picture is not quite as straightforward, as one would perhaps expect given the varying degrees of involvement further down the rankings and with those managers perhaps having less to lose by backing a differential captain. You can view more Gameweek 26 stats on Ragabolly’s site here. This blank planning getting in Bournemouth and Leicester assets is so similar to last year. We held crud like Walcott and the only reason we remember it fondling while missing all the hauls before the week was because captain Salah scored 4 goals and an assist ! Do I recall a load of West Brom lads too ? agree, if you are bringing in players now just because they play gw31 its gonna hinder your team between now and 31. Only option is maybe westham as they have a good run of fixtures anyway, maybe Bournmouth. We’d need to look at 2 or 3 of the West Ham or Bournemouth assets ! Meanwhile if a couple of random guys who blank in 31 start firing, we tend to ignore them to get someone like Ake! Leicester has the best fixtures of the lot, but I only see Pereira as an asset I would even consider. This time I'll probably keep playing the form+fixtures players and when the blanks get very close I may take some hits for the Walcottesque junk. Last year was a nightmare, wasted my FH early on so had to plan ahead and bring in all the crap for bgw31. Well this raises another point. I got Puncheon a couple of weeks ago as he was cheap and doesn’t blank. The problem is now it’s GW27 and he’s one my blank players and I don’t even want to start the guy ! Which option looks best for next GW? I do not know what to do with the Ings spot. D would be for price changes and BGW preparation. Also, who out of that starting 11 would you bench. Thinking one of TAA/Robertson as I can't see a CS. Has anybody ever actually sought help for depression? What's actually out there? You can talk to your GP or there are The Samaritans if you need to hear a human voice. Those are the usual options. You'd also be surprised how many of your mates have had it. I raised it last month after I'd had a few bad weeks with a couple of friends and they'd all experienced it and openly helped me. Talking to people helps. No expert, but think most of us been down at times. Talking to people is a good advise. I also think working out helps me when down. Yup, for some people depression is linked to boredom, poor diet or lack of exercise / sleep to release endorfins. Certainly affects me. Agreed. An lack of sun/daylight. I'm on vitamin D atm for this reason. Not depression, no. But I had panic attacks for 6 months and had nothing except a supportive colleague who basically diagnosed it for me. I didn’t even know what one was ! The doctors were no help, told me to do yoga. Eating better, excercise and keeping busy all worth trying ahead of those. Never been on them, but know people who have ! This is true. There is a difference between feeling down and low (often due to something that has happened) and depression. Not only is depression a longer state of things but the state of mind is completely different, nothing makes the individual happy, no hobbies, and you become prone to very dark thoughts. Its a shame how poor the treatment system of anxiety disorders are around the world. Panic disorder/attacks is a very treatable disorder. Exposure therapy can work wonders very quickly, but the therapist has to be hands-on and able/willing to do stuff outside of the office. What’s exposure therapy? As in having the panic attacks and beginning to realise you get through it and survive ? Yea pretty much. First you talk about how the attacks are not dangerous even though they can feel life threatening as they go on. Once they are on board with that idea, they can actively seek out situations that would provoke an attack, like going in an elevator or running on a threadmill (varies for each person). And then get through it without trying to escape to kind of teach your body and mind that the situation/attack can be tolerated. I did that exact thing. Still got more points than Sane! Cognitive therapy and/or medication depending on severity is the normal treatment. If you have an objectively decent life but find yourself trapped in negative thoughts regardless, results can often be very good. If your life is genuinely shite, results will be worse. I thought the UK had a pretty good system with fairly available cognitive therapy for depression and anxiety. Maybe Im mistaken. I tried to say that without going into detail. If the depression is result of a genuinely poor life then cognitive therapy and medication wont work very well. If its caused by unnecessary rumination/dwelling on negative thoughts, which is very realistically the core of the depression for many people, then cognitive therapy works very well. Yeah, GP wasn't much help to me personally but I can understand that it can be of great help, we're all individuals with individual needs after all. It's a very long process, far too many intricate parts to explain in a FPL forum but I'm in a better place now and that came from taking the first rather large step of understanding that I needed help. Feel free to give me a nudge if you would like a chat big lad. No but from family experience your GP can be a good starting point. May help if you're comfortable with a friend/family member going along as well. Not all doctors are equally knowledgeable and can help to have someone there who's a little more pushy on getting help. This is a big thing with GPs in my personal experience. Yeah, ask your GP about Talking Therapies. They've helped me out immeasurably over the years, and offered very practical advice on medication. Nothing to feel embarrassed about. There are some really good replies and sage advice above mate. For me, speak to your GP and take your best pal, wife, gf or mum with you. If you are offered medication, thats ok, but only for a few weeks. Get out, run, walk or even go to Tesco for a change of scenery. Try not to drink alcohol and if you do, fit it around an occasion such as a bootle or glass per a half of MNF etc. Find something you like. It'll take time to find it. I enjoy standing at my bunker listening to talk sport and doing 1000 pc jigsaws. Was 30 years between doing one and the next one after that a few years ago. Everybody is different. But we're all amazing. Be strong - its not always going to be like this is the motto I regularly live by. Because it isnt most of the time. Smile and laugh and talk to people if you can. Its hard but when you do, you'll find yourself giggling on the way home thinking "yeah that was good fun". I bet you are liked and loved by many you know and many you dont know. Never ever give up. It might not feel like it but my now departed mum told me at my lowest point that that uphill struggle Id had was me making it to the cusp of the rainbow. She was so right. Take care, have hope and good luck buddy. At least in the short-term, medication can help you to keep going and make things seem less dark. I would always recommend speaking to your GP first. Oh. Something I can given an insight into. The GP is an option but there was many places you can access yourself without referral (samaritans. Minds charity etc). The thing is it depends on severity. CBT is as effective as antidepressants but not a lot of people like to talk about it and go to a therapist. Usually if its mild its talking therapies. With severe depression it had to be both with frequent reviews. Looking at it from a personal point of view, talking with friends/family helps. As does exercise. Who will come in as auto-sub? Can someone explain why so many are buying aguero? He's expected to rise! No reason to flag this time as Aguero is available for their next PL game. He scored a hattrick last weekend. People buying for Auba who didn’t play today. you didn't just use "Auba" and "early move" in the same sentence did you? Need to replace Richarlison and can afford Mane but will need to lose one of Alisson, Robertson or Salah to do it, how about these moves? Yay or Nay? Alisson + Richarlison > De Gea + Mane? Who are the best two cheapest/rotation keepers to get for rest of season?? Not Ryan and Boruc, sold Foster for them and it's killed me! Bought a new bed last week and now I'm getting ads from Tempur on here. I get adverts for Big Booties. Not even joking. Bought a big bootie last week ? Hazard maybe if u can afford and don't plan on getting Higuain in the future. Which team will be relegated beside Huddersfield and Fulham? although they won both games against Southampton? Thank you for your answer. I still think so. It’s a very poor side still. Southampton have actually been a lot better recently too, despite today’s result. I can see them Newcastle, Burnley all managing to pick up just enough points. Thank you for the answers. This was kind. It seems that it decides between Cardiff and Southampton. I hope it will be Cardiff as I am a Southampton fan. It will, I don't know much about him tbh but massive step up for MLS to EPL. Mate you’re in the Top 5k. You cannot call your GWs bad!! Check my fall from grace out. Now that’s pain! yeah i'll take those 4 all getting double pointers!!! What's wrong with my team please I'm dropping like a stone!? Sane last week and Kola this week have been disasters! 1ft 1.4itb. Would u be getting rid of Everton players regardless of blank. Digne ➡️ Pereira for free?? Allows me Speroni ➡️Guaita for a hit. Genuinely would have been better off benching my two for the past month and playing my 4pt defense fodder. But every week I have another more pressing matter. Want Digne and Richarlison gone now. This run has Silva being fired written all over it. Yep, I'm regretting not moving one of the two on before this GW. Will probably ship both now and bench Aguero. Was planning on Firmino >> Auba / Lacazette for next game week but unsure now. Are next 2 harder than Huddersfield? Best replacement for Richarlison here? Mane out of question as already have 3 Liverpool unless I lose Alisson. Erikssen? Guessing D. Silva or Sane are out as this is for next week, not long term? Tough one - maybe a punt on Filipe, or one of the Cardiff lads, and then look at City from GW28? Would you consider Aguero > Auba, and just let Rich sit out the GW on bench you work out the best plan for the mids? Or if you don't fancy that, perhaps Mane's the answer and Alisson should go to unlock the slot (though I admit it would be risky to lose the double-Pool defence). Also Meunier the right back. If you had to punt on one midfielder for next gw who would it be? Is Martial a trap? What are other owners planning to do? I finally caught some luck this week, as I have him first sub for Rash. Was planning Martial and Rich > Mane (and value mid) - should I stick to that and wave goodbye with thanks for bailing me out this week, or re-assess after today's haul? Don't have him but think I'd take the pts and bail. Not necessarily this week though as it's mun-liv anyway, so have to make a call on whether he starts. How do these transfers look chaps? Thanks all. TAA not yet had a start and has United next, reckon I'd go Pereira. Watching MOTD. What an awful, awful way to lose 10 points. Yes, so innocuous. Last minute, and Huddersfields first goal since 2 January. Lucky man. Celt in Scotland here. MOTD just starting thanks to an hour of Scottish Cup highlights. Yeah, same boat, down from 40k to 90k in two weeks. Rondon? Newcastle with great fixtures but don't score many - otherwise Barnes? How has TAA not dropped in price after being sold by 600,000 people yet when I owned Snodgrass and 150,000 people sold him he dropped by 0.4!? Been asking myself this for weeks, something's not right there. Is Boruc a worthy 3.9 keeper? Swapping out Speroni for him. Will be selling Ederson nxt wk. Ian Wright on MOTD describing Iwobi as a "super player"
Said the same about Walcott 12 years ago. Thinking of selling Digne with my ft. Would you go for Kolasinic or Lascelles? Yeah Pereira is an obvious option due to fixtures that I forgot about.